Hmmm...I can't decide what I want for dinner tonight? Is it the goat head or the cow feet? Damn! I can't decide. Side note: This pic was taken last night. We decided on the fresh turkey, but I've tasted everything on that list except the tripe and cow skin. 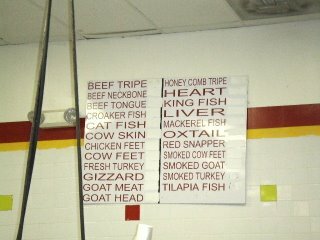 I've heard that tripe is good, but I can't figure out how one would prepare cow skin? MR.Bess you eat goat yeeeeeees!.Itsn't it yummy have you tried it roasted ? (ok b.bq)Its the best and the aroma as it roasts out of this world. Have you had the pleasure of visiting S.Africa yet? do sneak into Kenya the next time you go. Have a great weekend. It's gotta be goat head Stephen, it's gotta be goat head!! I see Gizzard on there... what the hell!?!?!? standing on the verge of becoming a vegetarian again this sign scares me to death! i think me and meat are gonna have to break up...i don't seem to have the stomach for it! Tripe is commonly used in my culture. We put it in pepper soup and other soups that we eat with FuFu. I think I would have gone with the turkey too...or the tilapia. I guess goat would be like lamb, which is good, not sure I want the head though. food is funny if you know what it is. Yeah, I'm not sure about the cow skin myself?? Will somebody pls tell me how that's good? That sounds good! Do you know how to fix that or do you have to wait for someone else to fix it? Yes, I am always surprised at what I'll eat. Goat taste a great deal like lamb. Haa haaa! I can see how chicken feet can look like baby hands. :) Baby hand soup! That's funny! 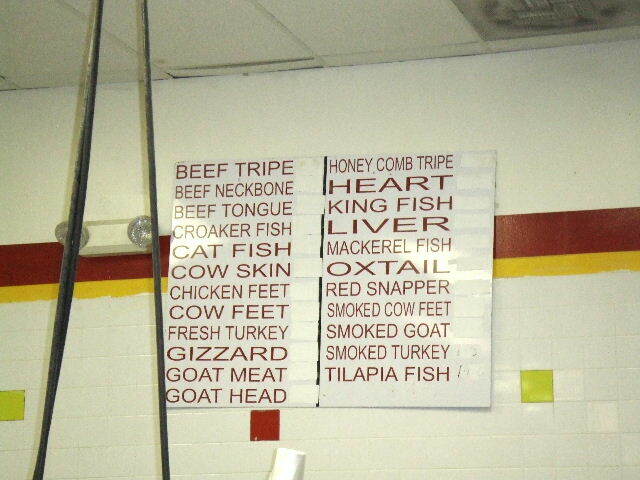 I'll have to see where I can find me some good tripe. Welcome back. I've never heard that. Thanks for sharing that. Grandmothers possess so much wisdom. For some reason, I just lost my appetite. Haaa haaa! LOL :) Sorry Rose.